Join 1708 Gallery for Community Conscience, a public forum for residents of Jackson Ward, 1708 Gallery, and the community at large to come together to discuss opening lines of communication, inclusion, and public art. 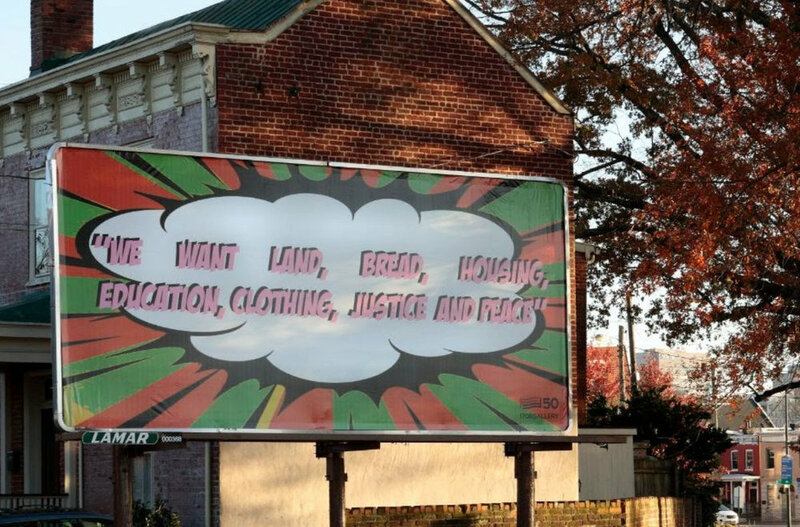 This discussion stems from Sable Elyse Smith’s commissioned billboard, located in Jackson Ward, and a conversation between Janis Allen, President of the Historic Jackson Ward Association and Park Myers, 1708 Gallery Curator. In partnership with the For Freedoms – 50 State Initiative, 1708 commissioned a billboard by Sable Elyse Smith. This public artwork opened in the historic neighborhood of Jackson Ward on November 12th, 2018 and has been a back drop to and a generator of many important conversations. As part of the expansive network of For Freedoms, 1708’s role is to amplify the social and political agency of contemporary art in the cultural landscape of Richmond.